Der µStick ("Micro-Stick") wurde entwickelt, um IEPE-Sensoren an Konstantspannungsquellen betreiben zu können, wenn keine Konstantstromquellen verfügbar sind. The µStick (‘micro stick’) was developed to allow for IEPE sensors to be operated with a voltage current source, in case no constant current source is available. IEPE sensors need a constant current source to operate. But many laboratories use data acquisition (DAQ) system which provide only voltage current. So far IEPE sensors couldn’t be used with such DAQ systems, even if they were better suited for the application for example because of their higher dynamics or their compact design (triaxial IEPE sensors with an edge length of 6 mm are possible). The µStick provides this possibility. This compact device can be connected via BNC connector on the sensor side. On the connector side the device is connected via a 4-pin M8 connector. A random supply voltage between 9-30 VDC is sufficient and usually available. The high bandwidth of the internal amplifier (0,5 Hz to 70 kHz @ 3dB) allows the use of highly dynamic IEPE sensors. 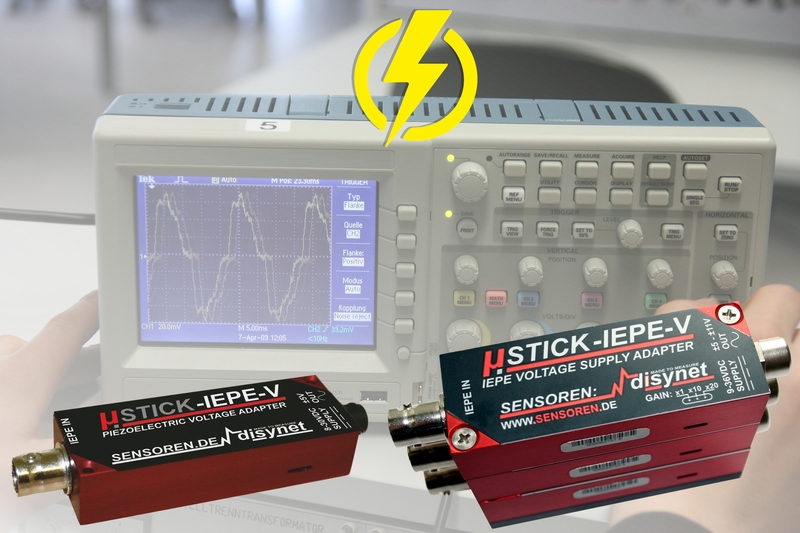 The µStick IEPE-V has an output signal of ± 5 V, proportional to the measurand, and IP30 protection. Additionally, a 10x and 20 x amplification is available and can be adjusted with a slider. Whereas the new type µStick IEPE-V+ has a 0-5 V output and a non-adjustable amplification and IP40 protection. The amplification is very low-noise and ensures precise measurements even in the bottom end of the measuring range of sensors with low sensitivity. For triaxial sensors the modules can be stacked and screwed. The µStick provides a simple and cost-effective solution for anybody with a DAQ system which is not IEPE compatible to use IEPE sensors without investing in an entire IEPE-specific DAQ system.